This week I am going to give Trader Joe's a break from trying to impress me with its fake meat offerings, and try out another Quorn product. So far, I've rejected their turkey, and enjoyed their nuggets. Now it's time to see how Quorn's Naked Chik'n Cutlets hold up to my expectations. These little guys were already at a major disadvantage, since I'd spent all week on my feet at school, cooking up a storm, so my enthusiasm for cooking was diminished. I decided to give them the naked experience, and just bake them in the oven with my typical chicken breast spicing. (that's salt, pepper, garlic powder, and thyme) I thought about making some kind of sauce for them but, honestly, the motivation just wasn't there. There were four cutlets in the box, so I used two for this first attempt, reserving two for when I could be more creative. I lightly coated each of them in olive oil, as directed, and then sprinkled my awesome seasoning blend on top, then baked them. Less than the suggested time later, they were done! They certainly smelled good, and looked like something I wouldn't mind eating. I sort of knew how this was going to turn out, but went for it anyway. I cut off a piece and ate it. Yep - just as I had suspected. Nice flavor, good meaty texture, but so, so dry. It was in desperate need of a sauce of some sort. I would compare eating a Naked Chik'n Cutlet to eating an overcooked boneless, skinless chicken breast. I ate it anyway, because it wasn't a horrible experience, and I was too lazy to get up and make a sauce. I have some ideas for what to do with the remaining two cutlets - I'm planning on cooking those up this weekend and writing about the dressed naked cutlet experience next Friday. Now the important decision… what sauce should I use? I'm leaning toward a chicken parmesan meal. Any ideas from my readers would be appreciated. 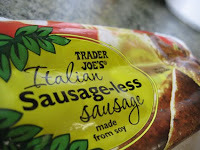 This week I tested out another Trader Joe's product - the Italian Sausageless Sausage. This was my second fake meat Italian sausage, which is weird because I tend to avoid the Italian sausage experience, due to the usual abundance of fennel and/or anise, and sometimes a level of spiciness I cannot abide. Why someone would want to make a sausage spicy is beyond me. Anyway, back to the matter at hand. Trader Joe's has been somewhat disappointing, as far as the fake meat experiences I have had from there. But these were in my fridge and had to be eaten sometime, so this was the week. 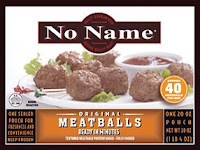 I had a friend over who is also not a vegetarian, but he sometimes eats fake meat just for fun, so I had him try one of these too. I cooked all four of the sausages up in my nice nonstick skillet in about a tablespoon of olive oil. I've learned from past sausages that a little bit of oil is pretty much necessary, both to form a nice crispy exterior and to prevent sticking. The pan was a little small for all four sausages, but I still got some nice browning. It only took a few minutes, and it was sausage time! Put them in some buns, and laid out a bunch of condiments. Okay - time for the actual eating. I found the texture of these to be quite nice, actually. Unlike the other Smart Sausage Italian sausages I tried, I didn't notice the no-skin lack of resistance. It was nice and chewy. The flavor was a little bland. If I'm remembering correctly, the Smart Sausages had a better flavor than these. I'd have to try them side-by-side to know for sure, though. On their own merits, the Trader Joe's Italian sausages were pretty inoffensive, and fairly tasty, although bland. My friend who was eating these with me commented that, "they don't taste like meat, but they don't taste like not-meat either." I'd like to add that they also don't taste like fennel/anise, and they don't taste spicy. It's more about texture and whatever condiments you add to it. Flavor - pretty mild… ok, bland. But inoffensive! I've been really sick the past week and a half, and haven't gotten to testing any new fake meats. To help make up for abandoning you last Friday, I'm letting you, the readers, pick what I test next. I put a poll in the sidebar to the right, so be sure to let me know what you want to see on here.